You thought I’d tell you all about this vehicle, didn’t you? Well, that’s just not going to happen. This article only contains facts and data that have received national security clearance. After all, we wouldn’t want TCM tipping off enemy forces about the potential vulnerability of this vehicle, now would we? I know, I know, you feel cheated. You popped in hoping to find out things like the types of ammunition this armoured vehicle is built up to withstand. But telling it to you would potentially risk the lives of Hungarian and international troops. And this is no joking matter. The only thing we can tell you (hell, the only thing we were told) is that the standard armour is classified as NATO L3+ which means it can withstand 12.7 mm machine gun ammunition fired from 30 metres and travelling at 914 m/s – that's 3290 kph, equal to 2.5 Mach. It can also withstand the blast from an 8 kg bomb detonated underneath the vehicle. I'll try to be a bit more specific: Level 3+ protection is just the minimum level of armour we were told about. This specification refers to the standard sandwhiched armour plates, i.e. the external metal hull of the vehicle. As for the protective layers underneath the thick metal skin, we are never going to hear about those. On the other hand we are told that you can add extra armour to the outside. You can see these extra plates on this prototype: these look like add-on insulation for buildings. Now on to the next question: just what on Earth is the Komondor? 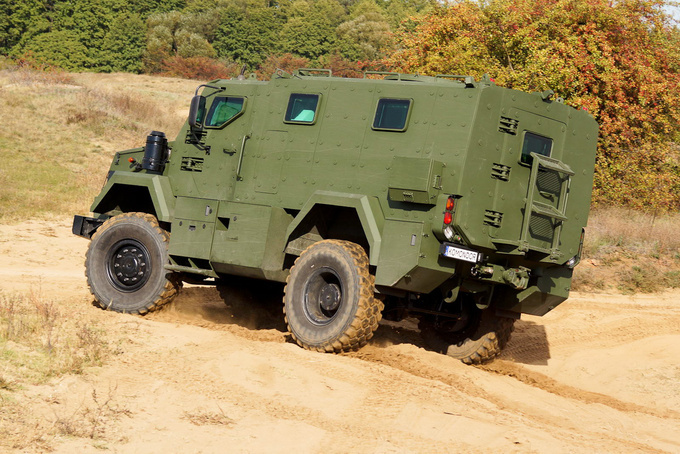 Well, it is basically a Mine Resistant Ambush Protected (MRAP) vehicle named after an old Hungarian breed of shepherd dogs. It is similar to the American Cougar (no, not by Mercury but by a company called Force Protection), a vehicle also used by the Hungarian forces, painted in desert cameo. MRAP Class vehicles came to fame in Afghanistan and Iraq, even though they were originally invented not by the Americans but the South Africans and the British as an effective countermeasure against the less-than-traditional warfare of using IED, a.k.a. improvised explosive devices. 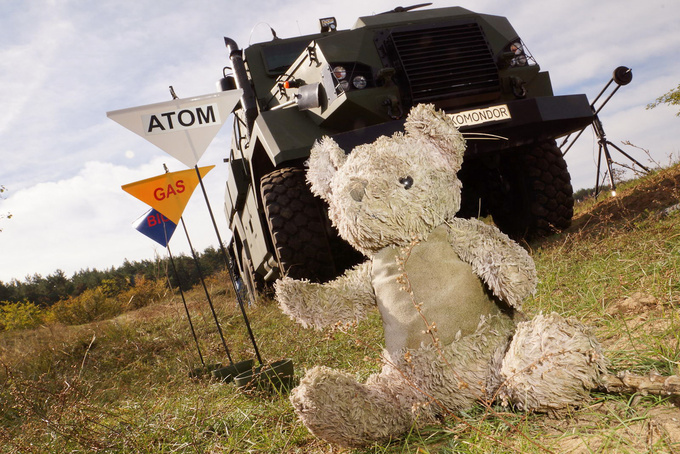 IED are makeshift devices of death used in troubled lands like South Africa or Northern Ireland: explosives are loaded into whatever is at hand – a briefcase or a car will do – and detonated as the vehicle column approaches. It is hard to spot IED's but MRAP can usually take the blast. It is little wonder the U.S. was eager to adapt the construction when they found out about it. The Komondor is built following the standard MRAP recipe: it has a V-shaped hull deflecting the force of the blast to the sides. Imagine this as a cottage turned upside down, with the roof pointing downward. 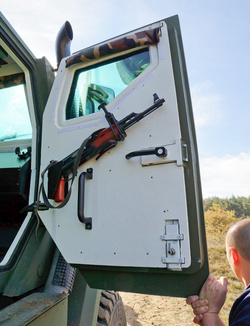 The only reason the vehicle appears to be of standard rectangular build is that the extra space is used as storage room for camouflage netting and the like. You can use these compartments for anything that is disposable, because stuff stored here will simply disintegrate in the event of an IED attack. We asked the representatives of the manufacturer about the drivetrain of this 15-ton beast but their answer was “whatever”. It does not matter what is driving the prototype because customers will be able to make their own choice. It is built using a 280 PS engine from Whatever company, but Whatever also has a 320 PS inline six. The engine feeds into a Whatever mechanical gearbox, turned into a semi-auto by the Hungarian engineers. Also there are excellent AWD systems available from – yes, you have guessed right –Whatever (a 4x4 in this case). The Komodor is also expandable. It is 6 metres long in standard specifications, but a 7.2-metre version is also available with three axles, all driven of course. As for the frame, there is none. The Komondor has a unibody construction and is built like a vault. The doors also open and close with vault-like ease. 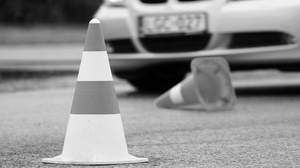 It is no big deal if the vehicle stands on horizontal ground but parked at an angle of any sorts you have to be careful. The doors open with such force they can jerk you right out of your seat if you fail to let the handle go. Closing it back up is pretty near impossible, unless of course you have previously specified power doors – a must for the Komondors in your private army, really. Now why would you buy them in the first place, you may ask? 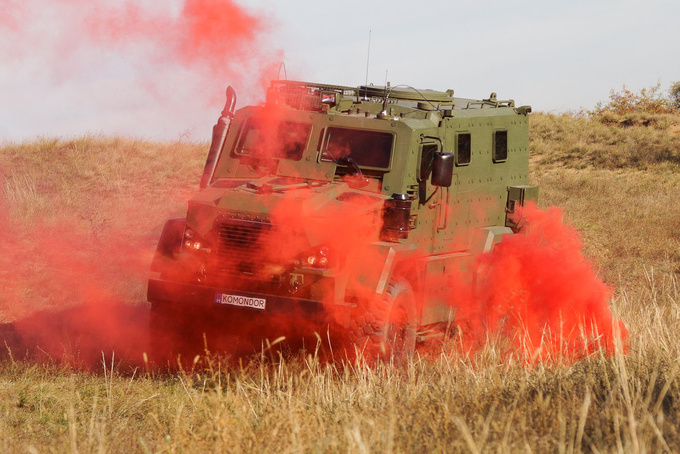 Perhaps because this vehicle class is not only suited for ABC (atomic, biological, or chemical) and reconnaissance tasks but is also perfect as an armoured transport vehicle, a commander's vehicle or an armoured ambulance vehicle. A flat bed version would be a great basis for installing rocket launch pads, and so forth. The Komondor may be a huge beast on the outside but it sure isn't overly spacious inside. 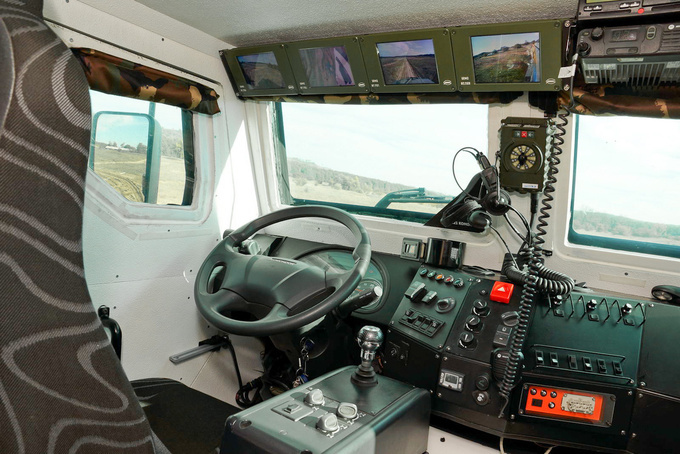 In its bare form the vehicle seats nine people; this ABC version has room for four, with the rest of the space occupied by monitors, instruments and gauges. There are perimeter cameras all around, relaying their images to the monitors over the windscreen. 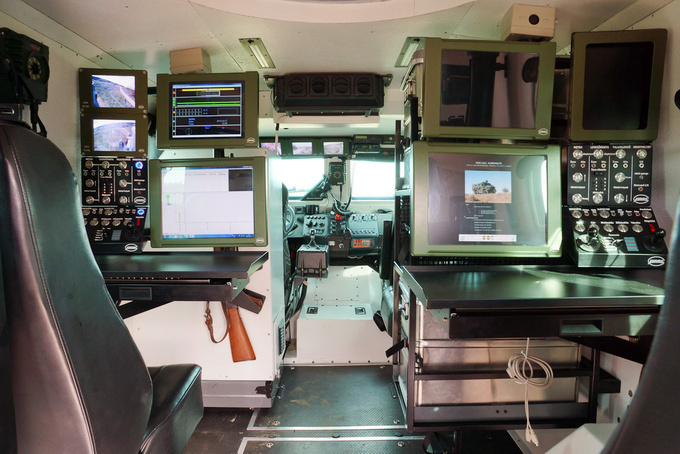 Add the night vision system and driving the Komondor suddenly feels like monitoring the vaults of Fort Worth or something. Windows are nearly useless for orientation: while amazingly thick, they are really, really small. Outside mirrors are larger than elephant ears blocking side view altogether. If no atomic, biological or chemical threat looms large on the horizon passengers can open the sunroof. It is huge and circular and just happens to be an excellent location for installing a machine gun. 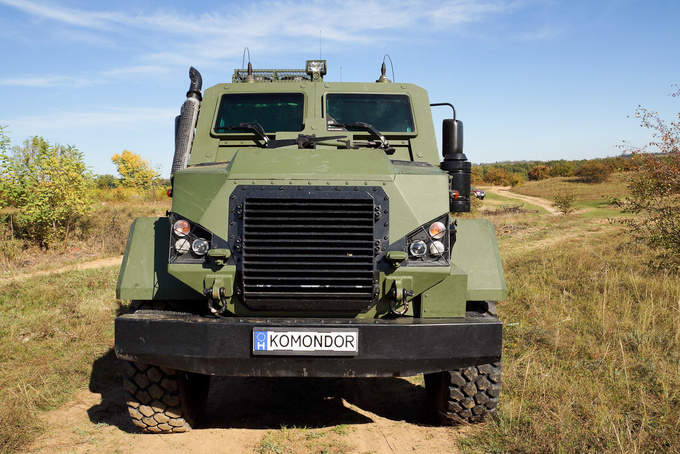 As for driving the Komondor: it packs 280 PS and 970 Nm. That sounds plenty but this is one heavy beast. The gearbox is extremely short, the vehicle can stroll along the terrain in third gear while the engine is revving hard over 2000 rpm. Inside it feels like a cruise ship – the Komondor sways gently. Lateral rollover angle is incredible 20 degrees but sitting two and a half metres above the ground you begin to feel insecure at a lot less. Sitting this high up you get the feeling you are operating a game console. There are servo motors everywhere. You could not move an inch without them. The steering wheel moves lightly, declutching is a breeze. Not only because the pedal itself is heavily assisted by pneumatics but also because you only need to work it at starting off and stopping. The gearbox itself is semi-automatic: the driver operates a short shift lever but the actual shifting is performed by a pneumatic mechanism. The air brakes feel strange if you have never driven a truck because there is hardly any feedback on the pedal, but I don't mind that. As for the rest of the crew, the cabin is hermetically sealed and is pressurised so nothing airborne can enter from the outside world. Passengers breathe filtered air; I was told bacteria and viruses used in biological warfare are all within a very specific size range which is how sensors pick them up. Air conditioning is standard specs and very effective, too. Data from integrated systems and sensors can be collected without wearing protective clothing. 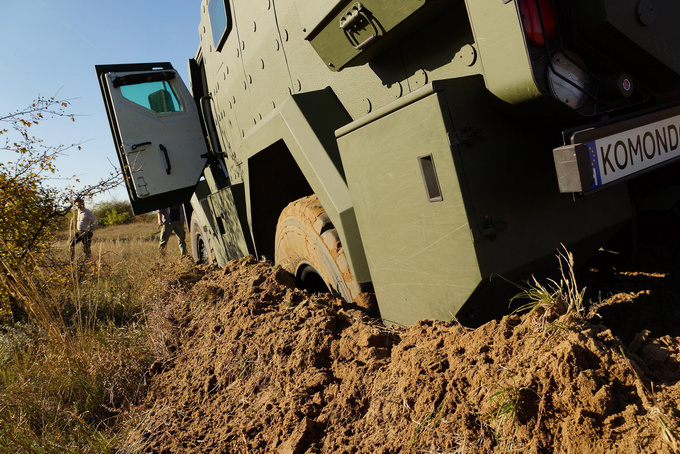 Soldiers have a comical although practical means of marking off the soiled area: the vehicle can launch small flags mounted on a roly-poly base. These are labelled bio / atomic / chemical and are also colour-coded, making it easier for troops arriving later to choose the right protective clothing. So how much will this vehicle set clients back? That is one piece of information about the Komondor that has been classified. We did find out however that it carries instrumentation worth several hundred thousand Euros – heck, even the keyboards can be neutralised for chemical agents – although that ‘several' was never precisely specified. Besides, there is more to army purchases than best price. 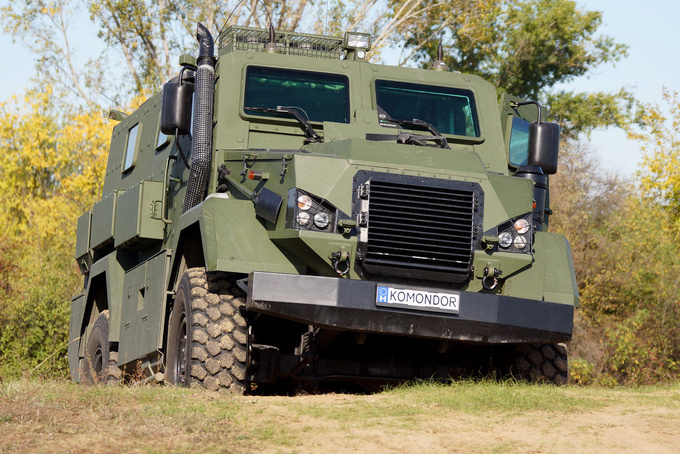 Suppose the Komondor costs exactly the same as the Cougar (which Wikipedia lists at 500 -700 thousand USD), the former is still a better choice for Hungary, simply because a significant ratio (up to 60%) of this amount would come right back into the treasury as taxes. We wanted to make the photo shoot somewhat special. We had everything it takes to take great pictures, smoke grenades and all. But what appeared to be green grass proved to be loose sand after all. And on sand the Komondor loses its composure. We find out the hard way that locking the differential after the vehicle had sunk axle-deep into the sand is not a viable solution as the axles don't rotate enough to engage the coupler knuckles. So we picked up the phone and... but I cannot tell you what happened afterwards, or I'd have to kill you all.